What is Opuntia chlorotica santa-rita? Opuntia chlorotica santa-rita is one of three varieties of the prickly pear cactus, Opuntia chlorotica. The varieties are santa-rita, gosseliniana, and chlorotica (Ferguson 1988), and var. santa rita is the most handsome. O. chlorotica santa-rita is an upright, open-branching cactus to 1.5 m with a distinct trunk (sometimes two trunks) up to 15 cm across. The cladodes are suborbicular, orbicular, or rarely obovate or even pointed. Cladodes are about 12 to 18 cm across with a bluish or purplish cast. Some individuals are strongly colored. Spines are absent in this Opuntia, or there may be 1(3) per in a few areoles at the tips of the cladodes. If spines are present they are yellow to reddish-brown or sometimes darker, and 2-3 cm long. 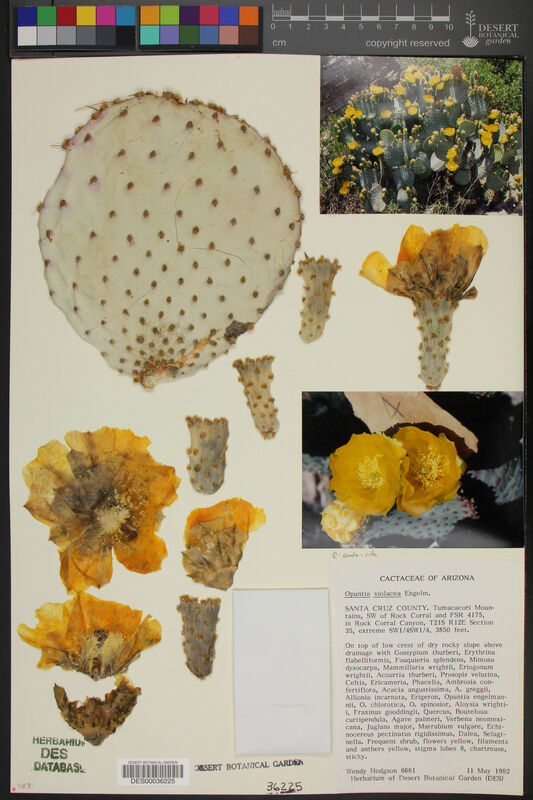 Britton and Rose described the flowers of this Opuntia as very handsome, deep yellow, and 6 to 9 cm across. The filaments and style are white, and the stigma is white or yellow. The fruit is oval and depressed at the apex; it is purple outwardly and greenish within and pleasant to taste. Read the original description. O. chlorotica santa-rita is diploid. O. chlorotica santa-rita is a sumptuous and large garden plant. Its coloration alone makes it valuable, and the large, colorful flowers are a bonus. Cold-hardiness seems likely to be moderate (USDA climate zone 7? ).